You can’t trip over your own shoelaces at the PMA photo-industry trade show without stumbling into someone offering to plaster your face on a mug, keychain, pen, blanket, or anything else they happen to have close at hand. While the idea of printing on unusual surfaces isn’t really new, it’s amusing to see just how many ways there are to immortalize yourself these days. Satisfy the Sweet Tooth I’ve had my share of photo-covered sugar cookies and can honestly say that I hope to never eat another one again. But chocolate, well, that’s a different story. 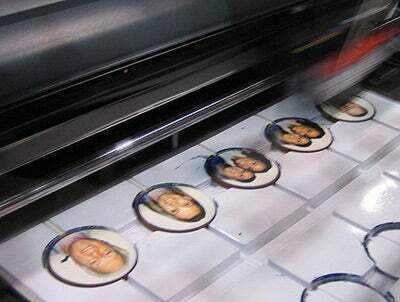 Chocolate ImageMakers will print your photo on milk chocolate lollipops, bars, or truffles. They were taking photos and printing them up right at the booth. I had planned to save mine for photographic proof, but…er…decided it would be best to do some “quality assurance” testing. The chocolate is a little sweeter than your average Hershey’s, but still quite good. Go Michelangelo Want to add Old World flair to you new digital photos? 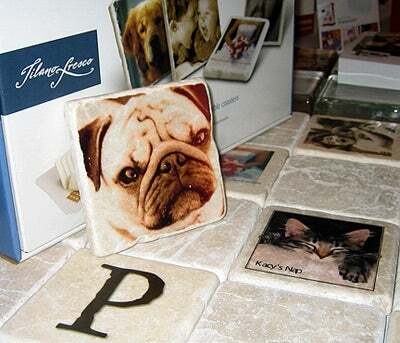 Tilano Fresco sells do-it-yourself kits that let you place your digital photo on a rough-hewn marble tile or simulate the look of an aged fresco (shown below). The $35 kits include everything you need, including the tiles. Bag It In a recent issue of Macworld , we used a favorite baby photo to create a stylish diaper bag. But at SnapTotes, you can do so much more. The site lets you choose from 10 different bag designs, and specify special options, such as the liner color. You can upload your photo on the spot or mail in a photo. They’ll even convert a color photo to black-and-white or sepia image if you prefer. But here’s the best part. If you’d like to give the bag as a gift, but want to let the recipient use his or her own photos, you can also order a gift certificate for a specific bag. A Charmed Bracelet For a one-of-a-kind piece of jewelry, check out My Life Designs. The site lets you turn your digital photos into charms for bracelets, necklaces, rings, and more. The company seals each photo into a sterling silver holder, so the photo won’t get damaged if it comes into contact with water. Some charms are double-sided, so you can maximize your photo real estate.